Am I missing something, or is there no fireworks show this year? Maybe I am misremembering that there had been in previous years? General Silver Dollar City Talk / Is There Anything LOST at SDC That You Are GLAD Is Lost? Is there an activity, a ride, a feature that you are glad no longer exists? We often mourn things lost, but some things are better done away with. I have noticed a drop off of activity since SDC closed for the season, which is perfectly understandable. We're all in the doldrums. But the forum here is supposed to help us get through it, and Top Tens are popular, so let's do a Top Ten Ways to While Away the Time till Opening Day! 10: Visit freshly paved parking lots on warm days to inbibe the smell. 9: Eat at a local Cracker Barrel. 8: Listen to Bluegrass tapes/CDs. 7: Wear Trading Pins to work. 6: Wear SDC sweatshirts out to play. 5: Grow a beard (gentlemen only, please!) and endlessly recite Ralphie Bolin’s lines from the hold up. 4: Take a clothed shower while pretending to aim a water cannon at a passing river raft. 3: Look through all the picture albums from past visits. 2: Watch all the SDC vids on YouTube. Again. Spend time on this Forum rereading favorite threads and chatting with other passionate/over-doing-it SDC Fans! Does anyone have some resonably clear, uncluttered photos of the Flooded Mine? I am looking to construct a scale replica--or at least an close approximation thereof--and need pics for a guide. Close ups are welcome and I need some overall shots. Older photos before it became so hemmed in would be especially useful. EDIT for Clarity: yes, pics of the outside, please! No hurry! Very Grateful for any help. I have long known that the church building was brought to the City from another place, but I had never heard from where. The other day, I read somewhere on the 'net--and therefore come here to ask the experts for confirmation, knowing how inaccurate random posts on the 'net can be--that it came from the Wilson Creek area. Is that true? If so, from exactly where? General Silver Dollar City Talk / Suggestion for a one-time Festival: ACW Sesquicentennial. We're about half a year into the sesquicentennial commemoration of the American Civil War. SDC should think about doing a one-time (or maybe just for a few years) fest or at least recognition of it. The period is almost right. The war had a massive impact on the area--from the battles leading up to and including Wilson's Creek (not to mention Forsythe) to the bushwacking that eventually led to the Baldknobbers--it fits the theme. Invite reenactors to come and take part. Maybe revive "For the Glory." Fire the cannon (and the mortars)! Speaking of which, does anyone have any history on those pieces? I looked the 6 lb gun over last weekend but counldn't find any of the usual markings. I didn't get a chance to look at the Coehorns. I have dug some pics out of the albums, several Kodak snapshots and one "official" photo taken, I suppose, by a city photographer. All are from a visit in July of '66 ; I was 26 months old at the time, so I really don't remember this visit. I do remember visits from the next several years (up till '71, next visit after that was in '82). I even remember a childhood nightmare about the Flooded Mine. 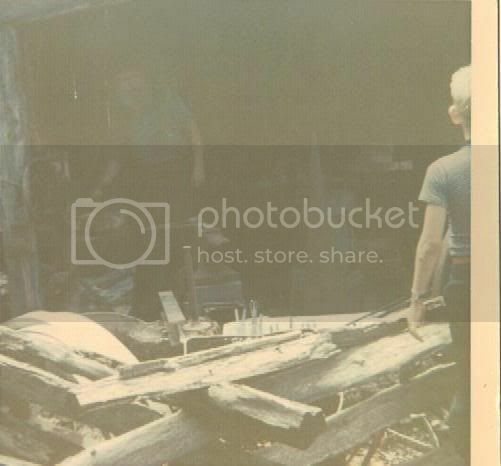 The first pic is very poor, but it shows Shad (I think) working at his anvil.